CHICAGO (AP) — Activists and others who were disappointed by the outcome of two historic cases involving the killing of black teenager Laquan McDonald by a white Chicago police officer see a way forward — by turning tragedy into political power. 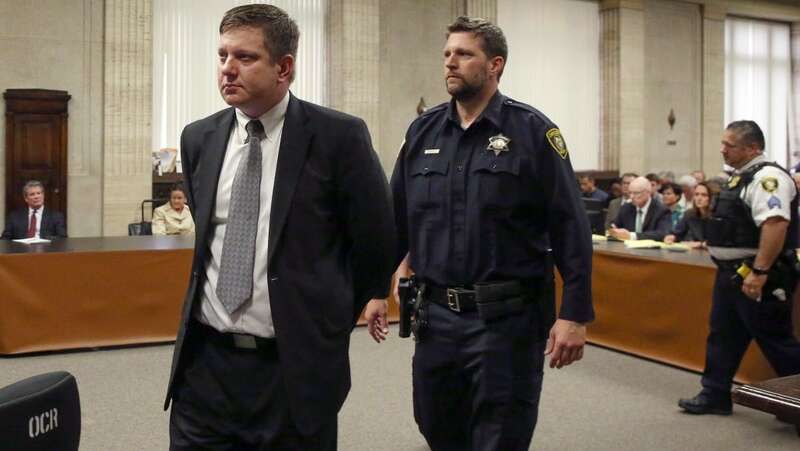 A judge on Friday sentenced former Chicago police officer Jason Van Dyke to less than seven years in prison for McDonald’s 2014 death. Video of Van Dyke firing 16 shots at McDonald as he walked away from the officer prompted protests, a U.S. Justice Department investigation of the Chicago Police Department and the firing of the police superintendent, among other changes. It also was a key piece of evidence in Van Dyke’s trial, when a jury last year found him guilty of second-degree murder and 16 counts of aggravated battery. The judge’s sentence of six years and nine months — less than half of the penalty sought by prosecutors — means the 40-year-old could be released in just over three years. It came a day after a different judge acquitted three other Chicago police officers accused of lying about the shooting to protect Van Dyke. Activist William Calloway, who helped force Mayor Rahm Emanuel to release police video of the shooting, said he and other community members were “heartbroken” by the judges’ decisions, but won’t give up seeking changes. Calloway is trying to defeat a five-term alderman in local elections next month to win a seat on the Chicago City Council. He has criticized the incumbent and other black aldermen for not doing enough to change the culture of a police force that has long had a reputation of racial bias and condoning police brutality. The McDonald shooting already has been a major factor in Chicago politics. The charges against Van Dyke were announced in 2015, the same day City Hall — under a judge’s order — released the video. The case was widely seen as the reason the county’s top prosecutor, Anita Alvarez, was voted out of office a few months later, and it’s thought to be a factor in Emanuel’s decision not to seek a third term next month. Roughly a dozen candidates are running to replace him, and almost all of them blasted both judges’ decisions this week and what they said was a lack of accountability for officers who commit crimes while on duty. “With so many members of our Black and Brown communities criminalized and jailed for non-violent drug offenses, Van Dyke’s sentence today shows that our lives don’t matter,” Cook County Board President Toni Preckwinkle, a top candidate who’s African-American, said in a written statement. READ MORE: Landlord to R. Kelly: Pay the $173K in back rent you owe or get out! The impact has extended to communities outside Chicago, said Rashad Robinson, president of the national civil rights organization Color Of Change. The group worked with Chicago-area activists to unseat Alvarez, with a “Bye, Anita” campaign. It’s also helped elect new district attorneys in places like Philadelphia and in St. Louis County, where a white officer wasn’t charged with the 2014 killing of Michel Brown, a black and unarmed 18-year-old, in Ferguson, Missouri. Color of Change opened an office in downtown Ferguson to support Wesley Bell, who last fall was the first African-American to be elected St. Louis County circuit attorney. Bell’s first action after taking office was to remove three veteran assistant prosecutors, including one who played a role in presenting evidence to a grand jury in the case. He’s also made policy changes, such as ending prosecutions for most marijuana possession cases. Changes implemented in Chicago include a requirement that the city release video of fatal police shootings within 60 days. The city has also changed how police shootings are investigated. The Police Department accelerated a program to equip all officers with body cameras. And the fact that Van Dyke was charged and convicted is historic — no other Chicago officer has faced the same fate in a half-century. The other three officers are believed to be the first to be charged with covering up a police-involved shooting. Even as McDonald’s great uncle lamented the length of the sentence, he noted the significance.